This web page will address these issues in detail. When we started cruising many years ago (with navigation by dead reckoning and celestial observation) we cruised without insurance. This was on a production fiberglass boat, without a single watertight bulkhead, and more than 20 through hull penetrations. This boat represented our biggest asset. It was our house money. If we messed up and left the boat sitting on a reef, or lost it to sinking, or fire, we would be in major financial difficulty. Spending our formative years cruising this way, often amongst poorly charted reefs, navigating frequently without celestial due to overcast, really focused our thinking. We were wary, never relaxed, and there was always a slight flutter in our stomachs – worry about the risks we were facing due to the boat on which we were cruising. We started to design and build our own boats in the late 1970s and the approach we took was based on those formative cruising years. What we did for clients was what we wanted for ourselves; designs which gave us the highest factors of safety, with a degree of tolerance for the mistakes in judgment which are going to happen. From the beginning, all our boats have had at a minimum two watertight bulkheads, keel structures designed to four times American Bureau of Shipping standards, and rudders to twice ABS. We’ve also worked hard at reducing draft, because draft is a major safety factor. Most of these factors of safety have rarely, if ever, been used by our clients or those who purchased their boats. But knowing that these yachts have an extra margin of safety built in leads to a feeling of emotional comfort that is hard to quantify, yet very gratifying. Just ask one of our owners. Our boats spend a lot of time cruising to far-off places with dozens of uneventful circumnavigations to their credit. One of the major reasons for this is the feeling of security they engender in their crews. <Of all the boats we have done, the FPB 64 represents the ultimate in terms of built-in factors of safety. Some of this we have already described in other sections, but we want to recap it here for you, so it is presented as a coherent whole. We’ll start with those things which get cruising boats in trouble. Of all the factors that get cruisers in trouble, fatigue is one of the most serious. When you are tired you make less reliable judgment calls. If stress is involved, perhaps due to weather, the decision making process deteriorates further. The fact that FPBs have such a comfortable motion at sea keeps the crew well rested and alert. Low noise and vibration levels further reduces fatigue and makes it easier to rest. Even the furniture design and upper and lower handrails help with fatigue. The layout keeps your body contained in the salon, galley, and aft cabins. In adverse weather you can work, move about and rest. Galley, forward watch standing area, and flying bridge are designed to be used when the boat is experiencing difficult conditions. As we have stated before, our experience with the FPB 83 is that it is more comfortable at sea than any of our previous sailing designs. The FPB 64 will offer similar benefits. High average speed reduces passage time, exposure to weather, and keeps the boat more comfortable. The fact that the FPB 64 has such a high power reserve (more than 100% at cruising speed), coupled with her hull shape, means that you will be able to keep up a steady 9.5 to 10 knots in most conditions, if weather or schedule warrants it. In spite of extremely conservative structure, which we’ve discussed in detail (and recap below) we operate on the assumption that at some point there’s a risk of hull penetration. Granted, with 15/32″ (12mm) bottom plate this is highly unlikely, but we still want additional factors of safety. This starts with a series of water tight compartments. It is the forepeak that is the most at risk for hull penetration – not through the bottom so much as from a collision which opens up the topsides. Should this occur any water which finds its way into the hull is contained forward by a full watertight bulkhead. Next there are two partial water tight bulkheads, one on each side of the raised salon. These contain breaches into the forward or aft sleeping areas. The fuel tank tops, below the salon in the basement, are themselves 4 inches (100mm) above the datum waterline which makes it almost impossible for water to accumulate in this area should a breach in the central hull occur. And then you have the bulkhead between the engine room and aft sleeping area which is another water tight barrier. Any penetration into the aft end of the boat (or plumbing leak) is limited to the engine room. Because we have an aluminum hull, with integral fuel and water tanks, the boat has a double bottom. In the extremely unlikely event that something would penetrate the 15/32″ (12mm) hull plate inside of a fuel or water tank, the tank itself will contain the leak. Having cruised for many years with 7 to 8 foot of draft due to performance requirements, we cannot begin to tell you how much more fun it is to cruise with a really shallow draft boat. The fact that the canoe body and stabilizer fins on the FPB 64 draw just a hair over 3 feet (90cm) is also a huge security bonus. OK, the skeg needs 4.5 feet (1.4m) but this is a small percentage of the total hull. So, if there’s an uncharted rock in your path, it has to be really near the surface to catch you. We don’t have numbers for risk factors and draft, but we are willing to bet that as draft drops risks are reduced in logarithmic fashion. Shallow draft is safe, and really shallow draft is significantly safer. There is another factor at work with draft. A boat which can maneuver in the thin water like the FPB 64 has many more options to hide out from bad weather (in particular, hurricanes). You can work your way up rivers, into mangrove swamps, and other areas where storm forces are likely to be mitigated and (equally important) there are less boats around you. Granted, with the FPB 64’s shallow draft, unintentionally parking the boat is not going to happen often. But when (not if) you do go aground, you are going to be very happy to have that 15/32″ (12mm) metal hull between you and the hard stuff. The stabilizers are also designed to provide extra factors of safety. Stabilizer shafts, for example, are 3 inches (75mm) in diameter. We could get by with a lot less – this size actuator is used on vessels up to 100 feet (30m) weighing as much as 3.7 times the FPB 64s displacement. For further protection the stabilizer mechanisms are installed in their own water tight “coffer dam”. In the FPB 64 engine room we start with using the best gear possible, over designed for the intended use, so that the risk of failure is minimized. This starts along the drive line. The 2.5″ (62mm) prop shaft is there not for turning the prop (we could do that with a lot smaller propeller shaft) but to increase the factor of safety for shaft stiffness when the prop begins to act as a Cuisinart. The propeller is made from Nibral bronze, an exceptionally strong alloy, the toughest available. The ZF280 transmission is conservatively rated, as is the John Deere 6068 TFM diesel, especially in relation to the minimal horsepower required to move the FPB 64 at cruising speed. The same applies to our DC generating system. The Electrodyne remote diode alternators are designed for continuous full field operation. Their huge output (each have 150 amps output at 28 volts continuous hot rating) is fused at the rectifier assembly in the engine room and at the batteries. There is a large diesel day tank in the engine room (roughly 100 gallons/375 liters) so you know you have lots of clean fuel to burn. And of course there is a robust fuel polishing system. When we think about ground tackle it is in the context of terrible weather, an exposed anchorage in which we’re trapped, and poor holding (from real world experience). We want our everyday ground tackle system to be designed for these conditions. On the FPB 83 we started with a 240-pound (110kg) ROCNA anchor – the best hook we have ever used, which has tested at twice the holding power of our traditional Bruce anchor. This is coupled to 3/8″ (9.6mm) schedule seven high-strength chain (26,000 pound/11,700kg breaking strength). The windlass is a very robust Maxwell V4000. There are a pair of large Fortress aluminum hooks for kedges and back up. This oversized gear allows us to anchor on two to one scope, and have reasonable holding. “How do we know this is the answer?” you might be wondering. A few years ago one of our Sundeer 64 ketch-rigged sailing designs went through a devastating hurricane on the Caribbean Island of Grenada. The boat was at anchor, unattended, sitting on our then-standard 176-pound (80kg) Bruce anchor, with the same 3/8″ schedule seven chain as we are using now. She was the only boat at anchor on the bottom end of the island which stayed put (in winds variously estimated at 125 to 175 miles per hour)! The windage of the Sundeer 64, with its two big masts and attendant rigging is probably higher than the FPB 83. Yet we went with a bigger, significantly more efficient anchor. Why? Because it allows us even more factor of safety in an ultimate situation, perhaps with poor holding, with the bonus of being able to anchor on really short scope the rest of the time. The FPB 64 has lower anchoring loads than the FPB 83. There is less windage and the FPB 64 is lighter. Our ground tackle package for this design? Exactly the same as for the FPB 83. The FPB 64 can handle this weight and we like the even higher factors of safety this system offers (you can never have too much holding power in your ground tackle). The best way to deal with heavy weather is to avoid it. With the FPB 64’s ability to maintain 200 to 240 miles a day in almost any conditions, most passages can take advantage of good weather. But routing mistakes occur. And on really long trans-ocean passages, there is often too much time at sea involved to avoid all bad weather. This is where the ability to maintain high average speeds comes into play again. Often moving just 50 or 100 miles away from a dangerous storm quadrant will make a huge difference in the weather you experience. The maneuverability of the FPB due to its hull shape and large rudder is another important heavy weather factor of safety. These characteristics allow you to run off before the wind and waves for much longer than is normally the case (which can be extremely important in avoiding tropical storms). And when you do head into the seas, that big rudder and relatively shallow forefoot allow you to maneuver adroitly, to take the worst of the breaking seas on the bow. Given the hull shape, heeled stability curve, and fin layout of the FPB 64, this is the least likely of all our designs to be knocked down. The lack of a keel makes it easier for the FPB 64 to skid sideways, absorbing wave impact energy over time, a major contributor to safety in breaking seas. Yet we are still designing for a worst case scenario. 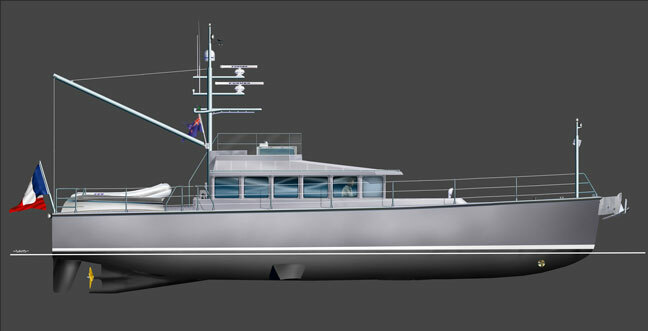 The engine room air intake is just off center on the aft deck, with a plenum that drops below the inverted flotation plane of the boat. There’s also a remotely operated closure plate for the air intake. If you were to turn the FPB 64 over in harbor and hold her inverted in this position, the engine room air intake would not admit water. The last consideration here is the inverted stability curve. With full water tanks, and half fuel, the FPB 64 has at least 130 degrees of positive stability. This is comparable to the FPB 83 and better than 98% of all modern sailing designs (including our own). By comparison, most commercial power vessels have a positive stability curve in the 60 to 70-degree range – which means they will not recover if capsized. Things happen, plans change, weather forces new destinations, and fuel burn increases. If your tankage is limited, and your fuel consumption rate increases due to adverse weather and sea state, you are forced to slow down to improve mileage. But reducing speed makes you more vulnerable to weather. This becomes a vicious conundrum, especially on longer passages. The FPB 64, with its huge fuel capacity and range, eliminates these problems. Even if you are down to half of your capacity, there is still a trans-ocean range (2800 nautical miles) at 9.5 knots (including a 15% fudge factor and allowance for hydraulic and electrical needs). Still, you would not normally leave on a long passage with half tanks. But if there were a disruption in oil supply, it is nice to know you’ve got the option (and if you slowed down to 8 knots you could go trans-ocean on a third of your fuel capacity). One of things that can really mess up your day is to lose steering. That’s why we design our rudder shafts to twice ABS standards. The tiller arm, to which the hydraulic steering cylinders are attached is machined from a solid piece of aluminum. There are dual hydraulic systems, each totally independent from the other. And our standard is to fit two complete autopilots. Finally, there is an emergency tiller, which is supplied with “relieving tackles” so that in the unlikely event of a total steering failure, the rudder can still be controlled. Most boats are adorned with lots of hull penetrations. Every sink, bilge pump, and salt water user seems to have its own hole in the bottom of the boat. The problem is, each of these holes has the potential to cause a disastrous leak – even sink the boat. Our approach is different. We minimize below the waterline through hulls, and those that do occur, are isolated by a water tight bulkhead (engine room and forepeak). All of these penetrations are in the form of welded standpipes, to minimize risk of accidental failure. In the case of the head exhausts and the forepeak salt water source, the standpipes end above the waterline. The rest of the exhausts, for sump pumps, bilge pumps, and sinks, are above the waterline. Another factor of safety is the way in which cooling for the refrigeration and air conditioning systems is handled. There is a special tank built into the coffer dam between fresh water and fuel tanks. Demineralized water in this tank is circulated to the air conditioning compressors and used with the fridge keel coolers. If there is ever a leak in this system, it will not fill the boat with salt water. A side benefit with this system is that pumps and heat exchangers last a lot longer, and you do not have to worry about plugged strainers when the boat is in a dirty harbor. We don’t expect our boats to leak. Still, there need to be bilge pumps on hand for every eventuality. This starts with a hydraulically operated damage control pump located in the engine room. This can be manually controlled, or run with a float switch in each of the watertight areas. The suction line pulls from the engine room, each of the three interior sections, and the forepeak. The nominal capacity of this pump is 160 gallons (600L) per minute – that is three 55 gallon drums of liquid every minute. There are 10 gallon (38 liter) per minute capacity PAR diaphragm bilge pumps for the forepeak, interior, and a double pair in the engine room, each with its own float switch and manual override. By now you have probably gotten the point that the FPB 64 represents a very secure lifestyle. As cruisers ourselves, what we like best about these various factors of safety is the total feeling of security and confidence they engender. Sure, there are going to be risks to be faced. But we feel significantly more secure at sea aboard this type of vessel than we do in our house or driving down the highway. This emotional security, along with the ambiance, and physical comfort of the FPB series is why we’ve put so many enjoyable cruising miles on Wind Horse in such a short period of time. It will do the same for you. If you would like to learn more about the FPB 64 contact Sue Grant: Sue.Grant@Berthon.Co.UK.. This entry was posted on Monday, October 17th, 2011 at 2:36 pm and is filed under Dashew Logs, Dashew Offshore, FPB 64, FPB 64 Updates, The Right Boat. Both comments and pings are currently closed. I like your approach to safety. My partner & I both have physical issues that would make an emergency at sea very hard & dangerous to deal with. Your designs make real voyaging a possibility for us & would bring the risks down to an acceptable level. I don’t know if we will be able to finance our dreams. That’s a maybe at this point but, even if we ultimately can’t, others are in similar situations physically. None of us are getting any younger & your boats open up a world of possibilities. Some people simply want that extra measure of safety for peace of mind but for others it’s an absolute necessity. Thx for all the hard work & thought you & your crew put into your boats. You all are making a truly exceptional product.